My love and respect for food began in childhood. Because I was raised on a farm until age 12, I would wake up before the school day to milk the cows, feed the calves, gather the chickens’ eggs, feed the pigs, and collect fruits and vegetables from our large garden. Farm work is not easy, but I didn’t know any different — it was our way of life. These experiences first attracted me to projects that enhance the work of child nutrition professionals. They, too, wake up early every school day to feed our children — and to them it also is a way of life. Additionally, my mom worked as a lunch lady when I was in elementary school, so child nutrition professionals hold a special place in my heart. When my parents divorced, my mom — suddenly a single mom — moved me and my three siblings to the suburbs, a setting which provided its own lessons in nutrition. For one thing, we quickly learned how to make our pennies count at the grocery store due to our limited household budget. This is where I got my passion for creating healthy meals that not only taste great but fit within the budgetary constraints of child nutrition programs. 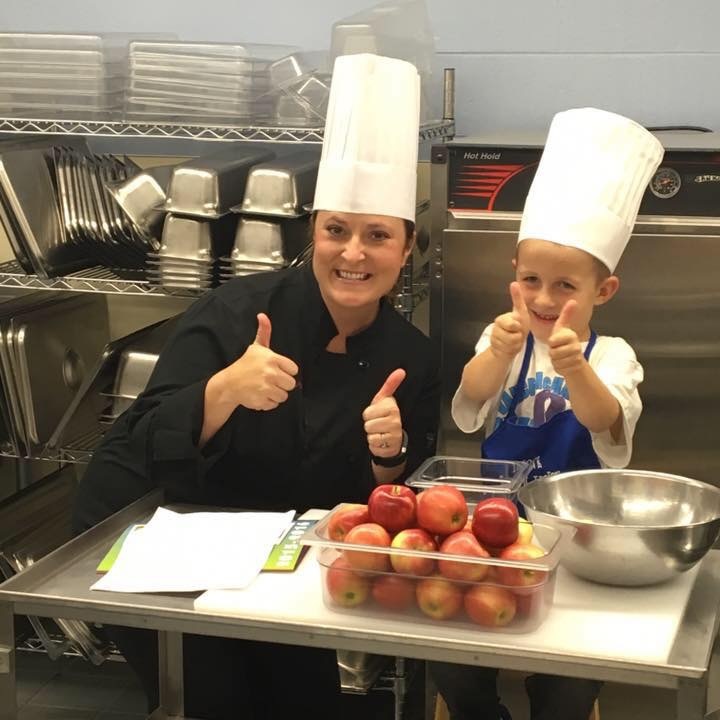 In 2008, when I began teaming up with child nutrition professionals on small projects, they immediately recognized the value of partnering with a chef who is also a dietitian — because I understand the boundaries within creating and preparing healthy recipes. A chef-dietitian knows that, to improve the flavor of a recipe, you cannot simply add salt or butter — you must revise it until it is delicious, always keeping the USDA meal pattern in mind. Healthy eating doesn't mean cardboard flavor, either. As I learned in childhood — both on the farm and in a single-parent, suburban household — it is possible to create a delicious (and nutritious) meal by mastering cooking techniques and implementing complementary flavors into a recipe.